In the 1850s the Australian Gold Rush was in full swing with thousands clamouring for passage. From 1852 to 1857, 226,000 left Britain to seek their fortune – 60,000 of whom were Irish. It is estimated that in a single month in 1853, 32,000 people departed Liverpool for Australia’s gold fields. Large, fast ships therefore were urgently needed to meet demand on this route. The Tayleur, reckoned to be the biggest and fastest ship of her type, was chartered by the White Star line to ply the lucrative Liverpool to Melbourne route. 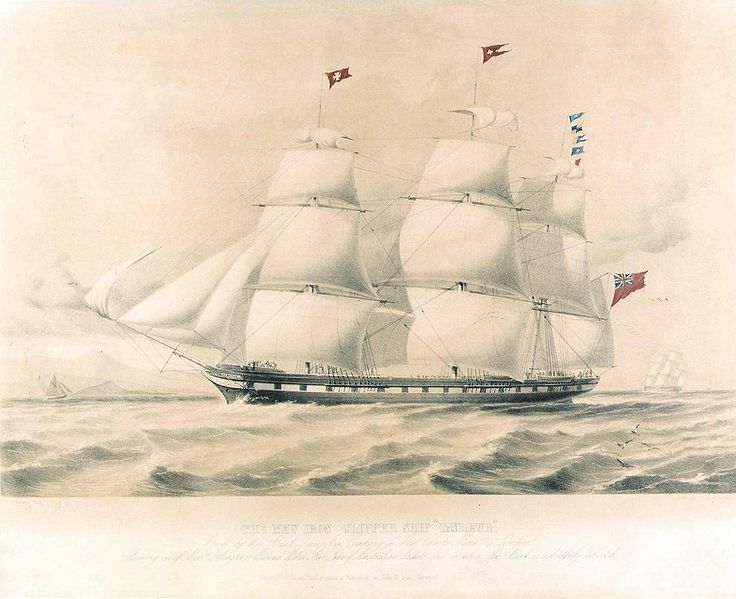 On January 19, 1854 the Tayleur departed Liverpool on her maiden voyage with up to 600 passengers plus crew on board. When sailing down the Mersey, the pilot noticed that the compass readings were slightly askew, but she continued on her way. Her route was to take her south along the west coast of Britain, but very shortly after departure she hit rough weather. On January 21 a squall developed and it proved almost impossible for the crew to steer the ship. Instead of travelling south, she had in fact been travelling due west and in the gale that blew up she found herself along the shores of Lambay Island, just 10 miles or so from Dublin, Ireland. Anchors were weighed but the lines snapped and she was dashed against the rocks. Some passengers managed to scramble ashore and climb the steep cliffs to safety but, in a short time, the Tayleur slipped under the waves with a loss of about 40o lives. ”The most desperate struggles for life were made by the wretched passengers, great numbers of women jumped overboard, in the vain hope of reaching land; and the ropes were crowded by hundreds who, in their eagerness, terror, and confusion, frustrated each others efforts for self-preservation. Many of the females would get half way, and then become unable to proceed further; and, after clinging to the rope for a short time, would be forced from their hold by those who came after them. Three women only, out of 200, were saved. One of those had got part of the way across when her legs fell, and she hung for some time by her two hands over the foaming waves; her husband then came on the rope, and managed to assist her to the shore. Two men came on shore with children tied to their backs but of the whole who fell into the water not above five were saved. I saw one fine girl, who, after falling from the rope managed to get hold of another one, which was hanging from the side of the ship, and which she held on to for more than a quarter of an hour, the sea every moment dashing her against the side of the ship: but it was impossible for us to lend her any assistance. Someone got a spar out, by which several got on shore; but it soon broke; and now might be seen hundreds hanging on to the bulwarks of the ship, each struggling to get on shore. I saw one young woman hanging on the middle of the rope for some time by her two hands, but those pushing to get on shore soon sent her to her doom”. Some 100 were buried on the island, others were buried where they were washed up on the mainland, but for many the sea was the last resting place. Of the 200 women on board, 100 were believed to be Irish. The style of dress that prevailed at that time – large billowing skirts – was considered to have been a contributory factor in the loss of so many females, together with the ferocity of the undercurrents and the high seas that bashed the ship off the rocks on Lambay. The iron hull had caused the compasses to read incorrectly and there were issues with the rigging and the sails that made it difficult to handle the ship in the high wind. The rudder was of a new design that had not been tested and there had been no sea trials carried out on this new type of ship – she had gone from being fitted-out straight into service. The Tayleur Medal. Awarded for bravery in sea rescue. Donations flooded in for the survivors. The residue of the fund was set aside to be ‘available at once for such shipwrecked strangers as may become future claimants on the generosity of the citizens of Dublin’ and so the Tayleur Fund Medal was inaugurated. 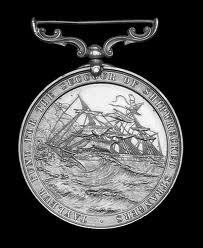 The medal bears an engraving of the Tayleur and the inscription ‘TAYLEUR FUND FOR THE SUCCOUR OF SHIPWRECKED STRANGERS’. It was awarded to 44 people before the fund was wound up in 1913 and the residue donated to the RNLI (Royal National Lifeboat Institution) in exchange for a motorized lifeboat for the Dun Laoghaire Lifeboat Station. The Tayleur was largely forgotten until the late 1950s when a sub aqua team went in search of the wreck. Local fishermen had reported that lobster hauled from a particular location had red undersides as though they had lived on a rusting wreck. The lead was followed and the wreck was located. In 1963 her bell was discovered and raised to the surface and is now in the Maritime Museum in Dun Laoghaire. 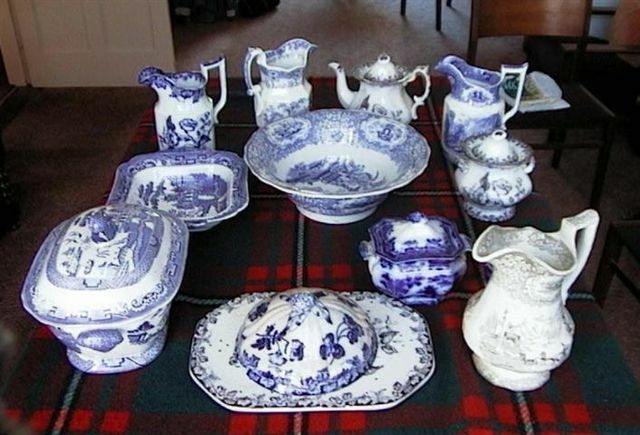 Many artefacts such as these patterned jugs and dishes have been recovered. One of her two anchors is displayed in Rush Co Dublin, where regular commemorations take place. The White Star Line which had chartered the Tayleur would later get into financial difficulties. In 1868 Ismay bought the trade name and the logo at a liquidation sale. Almost 60 years after the launch of the Tayleur – the biggest fastest ship of her time – registered in Liverpool and proudly flying The White Star flag on her maiden voyage – another ship also registered in Liverpool – big, fast and unsinkable, would leave port flying The White Star flag on her maiden voyage and, like the Tayleur, just days later, would end up on the sea floor with heavy loss of life. A broken stove, a cracked pudding bowl, a rusting Jacob’s biscuit tin, assorted dusty kettles, tins, teapots and glassware scattered about the floor, itself buried under old newspapers and decades of debris.Vivid green paint peeling from the walls and a holy picture propped up below the open cupboard doors, a cupboard where once two of the good teapots and the decorated plate may have been proudly displayed, to be taken out when visitors called. This is the startling image on the dust cover of a remarkable book of photographs of the interiors of abandoned houses in Ireland, beautifully photographed by David Creedon. David Creedon is a talented photographer who has already established a reputation as a photographic artist of international renown. Born in Cork, David has exhibited in many countries and is the winner of several prestigious prizes. He currently has work in the National Portrait Gallery, London. Having first heard him interviewed on radio in which he explained how he became enthralled by abandoned homes, I was thrilled to find his book under the tree on Christmas morning! This large format book is lovely to look at, with over 70 original full-page colour photographs of kitchens and bedrooms, – once warm, lived-in private spaces – and of items such as clothing, boots, letters once cherished, intimate possessions. Each photograph occupies a full page with short, unobtrusive, explanatory text on the opposite page. This large picture format in a way accentuates the intrusion into the private lives of people in what was their own secure space, and also underlines the sadness of the crumbling remains of homes, where people once lived, laughed, loved and were loved. On first reading, I went from page to page looking at the pictures and was struck by how familiar these places looked to me. I can remember relatives and neighbours living in similar welcoming kitchens, with heat radiating from either the open fire or the Stanley range (stove), the aluminium kettle always on the boil; the aluminium teapot always ready for the spoon of tea, the good china lovingly exhibited in the corner press (cupboard). I wondered what had happened to the occupants – had a last surviving member of a family passed away, or had an entire family emigrated? Some of the images however contain items that had come from abroad, letters, items of clothing, perhaps ‘sent home’ by an emigrant. In the foreword, Dr Breda Grey contextualizes these pictures in an Ireland of 50 years ago, beset by emigration. Her work at the Irish Centre for Migration Studies at University College Cork in 1999- 2000 saw an oral history of people who stayed behind in Ireland collected, adding a further dimension to these abandoned homes. She states: ‘Individual preferences with regard to staying or migrating were rarely openly articulated. To do so would be to break the communal silence, to challenge the collective denial and to name the pain caused by difficult familial dynamics of staying or going‘. Readers will be struck by the number of religious artifacts in these pictures. Statues and framed pictures with their stylized images once had pride of place in these homes, and were probably a great source of comfort, or perhaps the only comfort to those who gazed on them. They have now fallen of f the walls and stand abandoned in these silent spaces. This book will appeal at many levels: those interested in photographic art will delight in the photographic composition with page after page of technically pleasing images. The photography conditions were challenging – these old abandoned houses were often dark, having been overwhelmed by trees and bushes, with no additional means of lighting. One image in particular that of the Star Spangled banner with only 48 stars hanging next to a green dress required an exposure time of 6 minutes! In these pictures the people are gone. Absent. With them have gone their memories, their stories, their joys and their sorrows. This book will not enlighten the reader about who these home owners were, or what became of them. It is part of the attraction of this beautiful book, that the observer must complete the story of what led to the abandonment of these once cherished objects and these homes. The spaces and artefacts of lives have been skillfully presented by David Creedon and will stand as a social historical record of mid -20th Century Ireland. 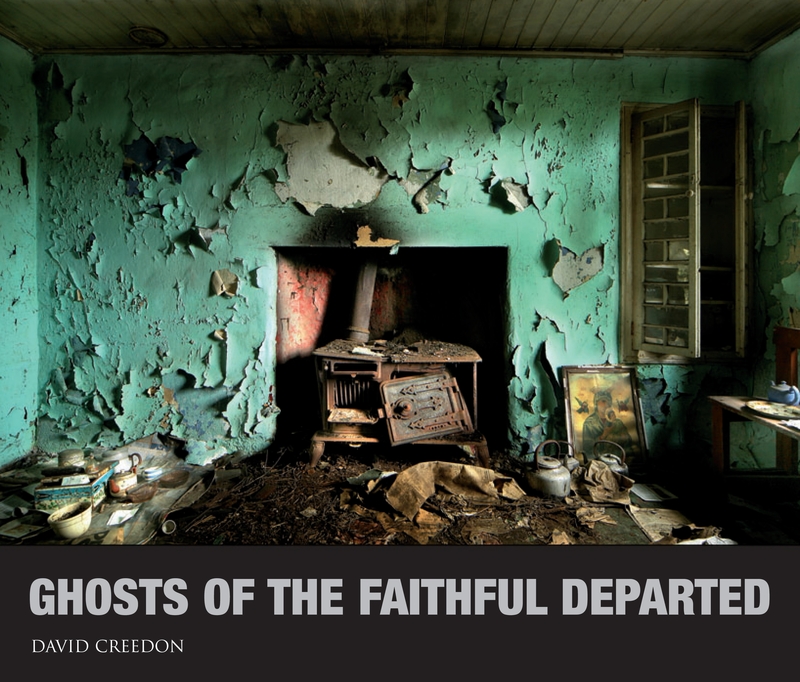 Ghosts of the Faithful Departed – A selection of images from this book can can be seen here at David Creedon’s website.. Breaking the Silence: Staying at home in an emigrant society . 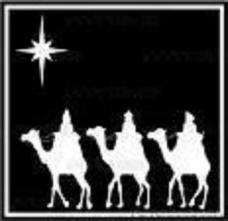 The UCC archive – read or listen. The Titanic centenary commemorations were launched today in Cobh, County Cork. Cobh, or Queenstown as it was then known,was the last port of call for the ill-fated Titanic. Today, the LE Emer of the Irish Naval Service, was alongside and exchanged a gun salute with nearby Spike Island. There then followed the release of 123 flares from Spike Island, one for each of the passengers who boarded at Queenstown in April 1912. A poignant remembrance of those who last stood on Irish soil 100 years ago and left family and friends in search of a better future. Throughout 2012, Cobh will lead the Irish tribute to those who lost their lives on the Titanic as well as those who survived. Many events to remember the Irish ship and her passengers will take place during the year-long commemoration- exhibitions, lectures,concerts,visiting cruise liners, markets,church services and naval displays. The impressive exhibition centre will be a central attraction to all visitors to the area. 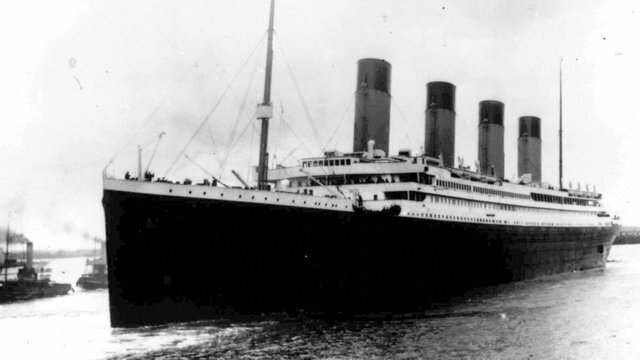 There will be frequent posts on this site throughout the year on the Titanic 100 commemorations at Cobh and in Belfast as well as in The Titanic Village – Addergoole, Co Mayo.